Entertain in style with the ever elegant oyster plate, delighting refined diners since the 1800’s. 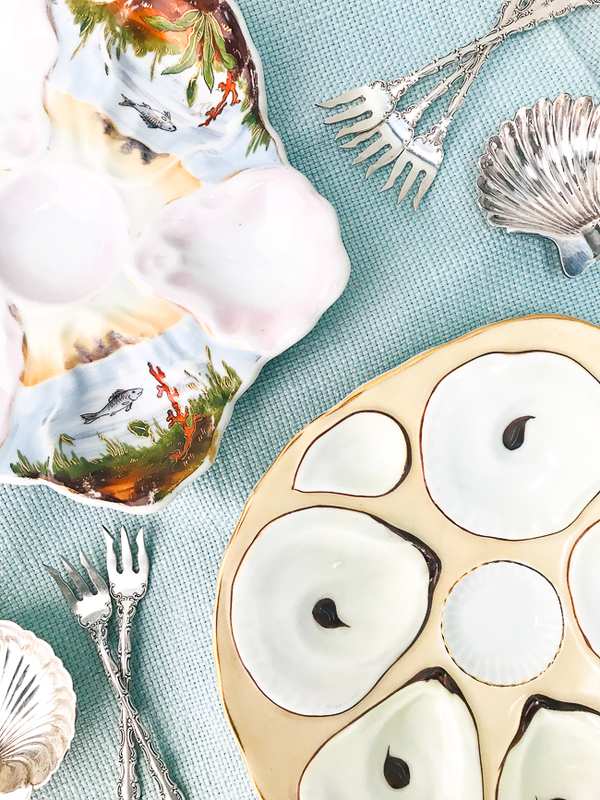 Learn more about these charming dishes, their history and how to collect. Candlelight flickers, music stirs the air, and elegant florals cascade across the table as guests saunter into the dining room. Chairs are pulled, napkins unfurled, and delighted chatter ensues as servers bring forth delicacies from the sea. Guests are served 6 slippery little fellows merrily nestled over ice on charming dishes. From the mid-1800’s on these shellfish delighted refined Victorians at elegant dinners from Europe to America as a requisite premier cours! Manuscript cookbooks as well as home etiquette and domestic guides listed them as a must on dinner menus. Seafood was increasingly available to middle and upper class Victorians regardless of proximity to the sea as transportation from the water inland increased in speed and reach and the production and keeping of ice improved. Oysters became extremely popular to the extent they were much over harvested by the end of the century. Service à la Russe in which servants bring each course to the table on platters to be served and/or pre-plated became popular roughly at the same time. This style of dining replaced the previously customary service à la Française, which more resembled our current family style of dining. And as everyone knows the Victorian’s simply loved their tableware and dining accessories: a proper time and place for everything and to everything a purpose. 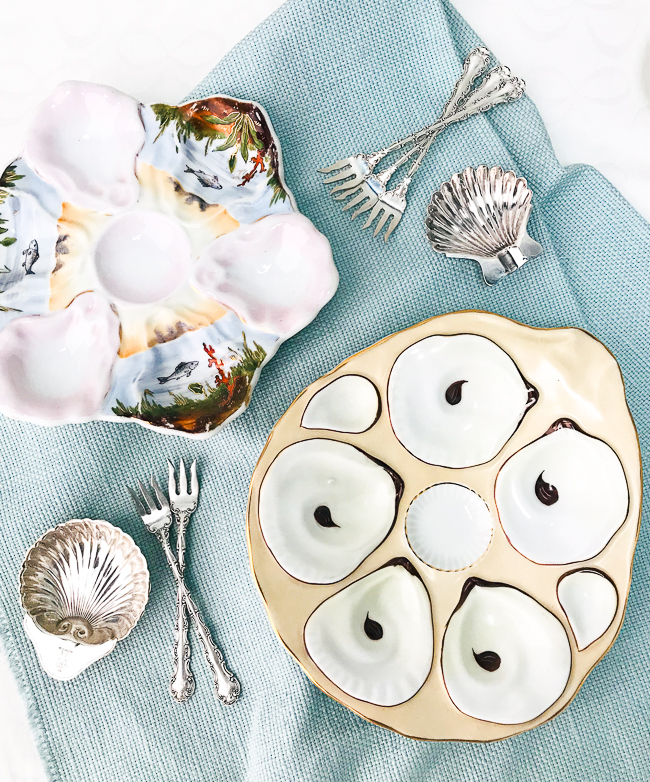 A plate made especially to hold only one thing: oysters. With little wells for the oysters to nestle in and indentations for condiments, oyster dishes are an elegant solution to serving and displaying the requisite premier cours! Oysters could be served baked, raw, on the half shell or shucked. They were also popular in pie type pastries and as stuffing. If you have had the delight of being served oysters on an oyster plate, saltines and shot glasses musts be banned forthwith! These days oyster plates more often than not are prized as wall decor and china hutch ornaments. Their aesthetic appeal is genuine. 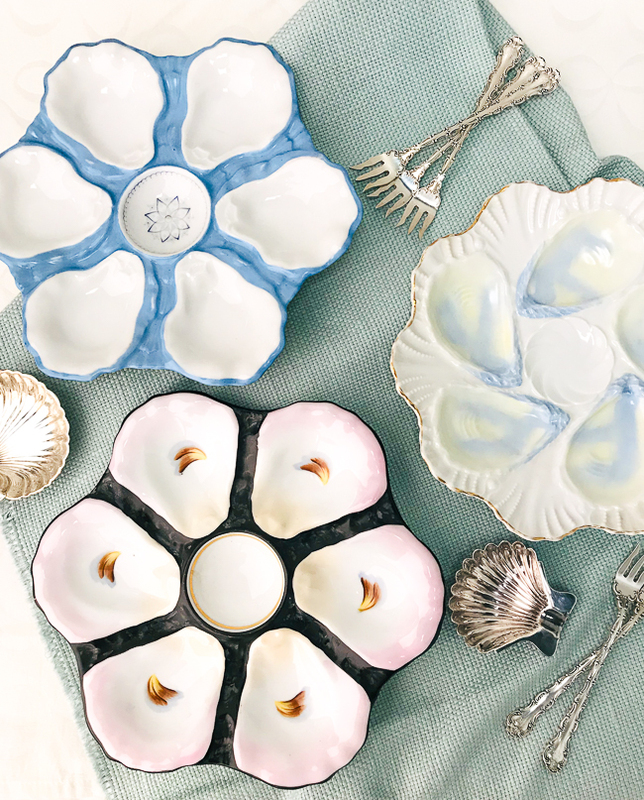 From ombré pastels to naturalist sea motifs, these charming dishes come in a variety of colors, themes, and styles although there are only 3 main shapes: geometric, kidney, and the turkey. Oyster plates come in a range of prices ($80 – $500) as well as styles and were made by a variety of European ceramic manufacturers. Arguably, the most sought after are hand-painted Limoges and colorful Majolica, especially in sets of 6 or more. Antique oyster plates were used, so expect some wear, but avoid ones with chips, cracks, crazing (a fine network of surface cracks to glaze), or extremely worn gilt or design. To create a curated collection, choose one style, color, shape, or maker and buy within that aesthetic. Do not expect all antique oyster plates to be marked on bottom. To display your collection on the wall use plate hangers with plastic coated tips to avoid scratching. The oyster plates pictured here are available at auction on January 26th via Case Antiques, Auctions & Appraisals. 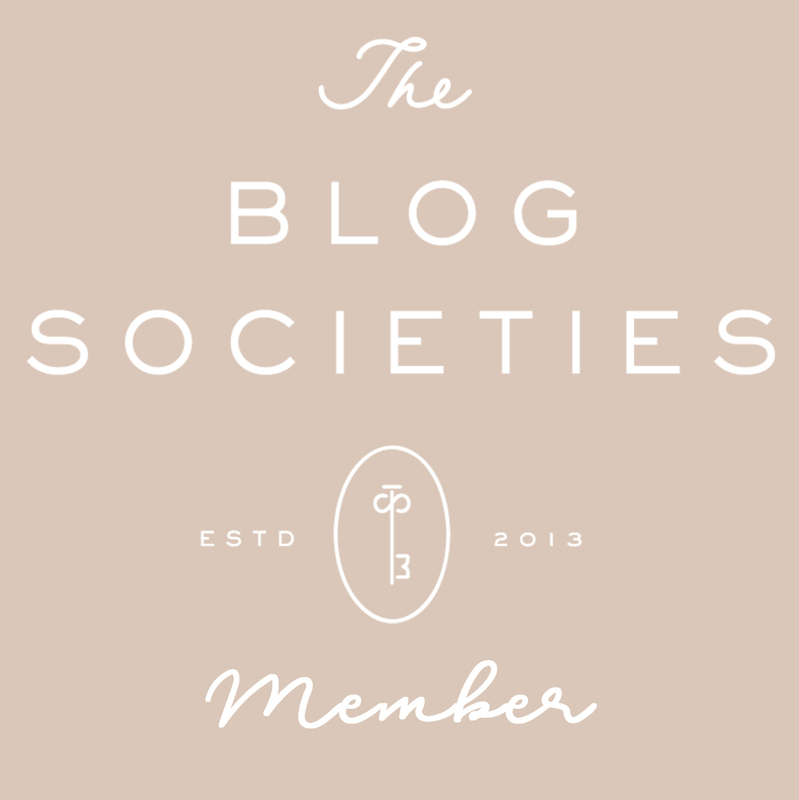 P&P will be featuring a new post series about Southern heirlooms. 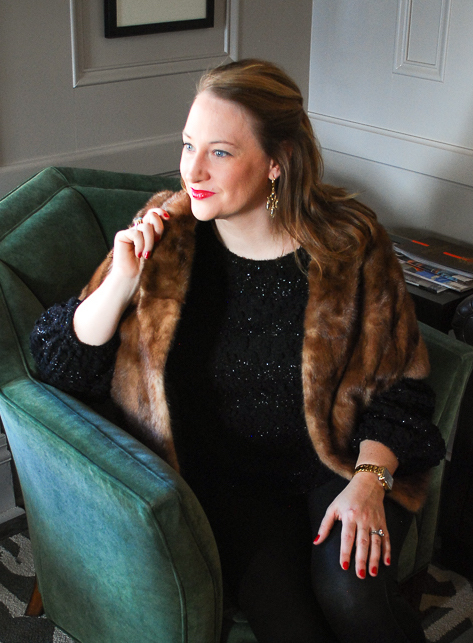 I will be delving into attics, rummaging in our grandmothers’ china cabinets, scouring estate sales and auctions, and hunting through linen presses to discover and explain treasured family antiques. As Southerners we have strong ties to the past and cherish our family’s treasures passed down through the generations, but we don’t always know much about the objects themselves. My aim is to explore these antiques and shed a little light on what they are and why they are important. Full disclosure – I do this for a living too! I am a director at Case Antiques, an international auction house selling investment quality art and antiques. I have a master’s degree in history with expertise in American art. Want me to cover a particular style, antique, artist, or subject? Comment below! Loved learning about the oyster plate! I wonder if my grandmother left any heirlooms because I would love to showcase something like this in my kitchen. Thanks for stopping by, so glad you enjoyed the post! Yes, I think that would be a wonderful display.